- designed to help small manufacturers handle their daily tasks more efficiently while also giving them the insight to better manage their operations and meet their long-term goals. We’ve added manufacturing-specific functionality to a market-proven base of powerful Accounting Software tools. The result is a business management solution that is ideal for small manufacturers. Now they can easily handle challenging tasks such as complex BOM management, work ticket creation, serialized inventory tracking, the generation of manufacturing-specific operational reports, the ability to buy and sell in different quantity units and automated quantity discount settings. 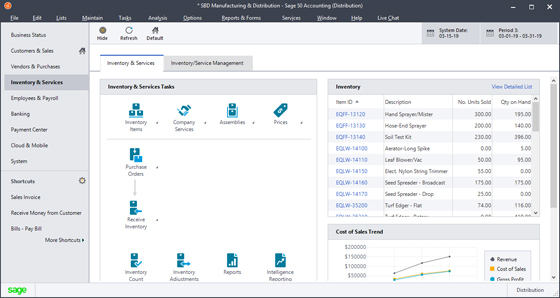 Additionally, Sage 50 Peachtree Quantum Accounting Software including special Manufacturing 2019 couples user-friendly tools with robust functionality that appeals to manufacturers in a range of industries, including printers, tool & die makers, millworks, industrial equipment producers, textile firms and apparel makers, just to name a few. 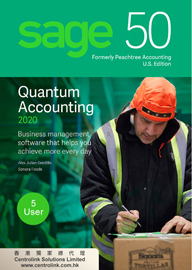 Sage 50 Peachtree Quantum Accounting Software for Manufacturing 2019 also offers company consolidation, which is ideal for customers managing multiple businesses simultaneously who want to merge data for overall analysis. *Multi-level bills of material with full explosion down to 16 levels deep. * Net-change physical inventory with cycle counting. *Batch-oriented or direct entry of all stock transfer transactions. *Full back-flushing of all assembly transactions. *Choice of standard, average, LIFO, or FIFO costing methods. *Cost adjustment with roll-up through all BOM levels. *Work orders to document and track production activity. *Record detailed stock status for all inventoried items. *Track inventory in multiple locations. *Maintain inventory levels with minimum, maximum, and reorder points. *Instantly display transaction history, where-used (BOM implosion), and outstanding order status.